Botswana is a challenging country but its rawness makes it really exciting. The terrain can be difficult but adds to the adventure. The isolation of the Central Kalahari Game Reserve was so appealing and the drive through the Ntwetwe Pan such fun. Nxai Pan was special too. Botswana has the most spectacular sunsets and night skies making bush camping a truly magical experience. With ease we drove into new territory but couldn't buy 3rd party insurance on the border. We soon found a picnic spot where we bushcamped with some eccentric Swiss people and had a delightful evening of staring through their telescope looking at Mercury, Saturn's rings and Andromeda (apparently). In the morning we stocked up with fuel and provisions at Ghanzi before heading down the sandy track and into the Central Kalahari Game Reserve (CKGR). To tackle the Reserve the books suggest you need at least two tip top cars, masses of recovery gear, 4x4 experience and to be self sufficient. We had lots of wine and a sense of ambition and figured that would be enough - after all, we're experts!. We only got stuck once in the first 140 km whilst turning in the sand. Going into low box was sufficient to rectify the problem. There wasn't even a requirement to let the tyres down. For tourists the park entry, car entry and camping fees cost £11 (80 pula) per person, per day. For the locals it is around 5 pula! This is the Botswana tourist policy - rip them off big style and keep their numbers down to minimise environmental destruction. In reality it is a sound policy as the area is preserved and for most tourists the price is still cheap. Of course we didn't book which meant that we were in for a telling off by Mr Official. Booking all these campsites ahead of time (by phone if you can find one) really restricts your flexibility. Gordon was up all night being sick. He initially thought it was the chilli but it must have been the water. Gordon had been drinking unfiltered water so we made a plan to drink water only from our filtered supply. We decided to move on to the proper camp site and stay there until Gordon was feeling better. It is necessary to book your sites in advance - goodness knows why as they are literally a clearing in the sand and no-one is there to check up on you. You get a tree for shade if you are lucky. There are no facilities. We parked up alongside Pipers Pan where there is apparently a lot of wildlife activity in the evenings but nothing much was going on mid-morning. Gordon took to his bed for the day whilst I got on with a few jobs and watched out for approaching predators. There are no fences in this park and apparently animals galore. 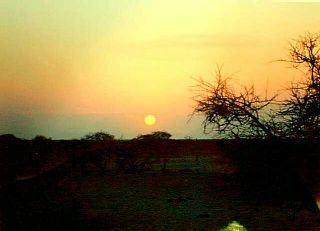 We went for an evening drive but only caught sight of a hyena carcass and a beautiful Kalahari sunset. I am starting to get into photography now I am becoming familiar with some of the terms and techniques. That night we were visited by a friendly jackal who was very interested in cheesy biscuits and water. The following day we drove through Deception Valley which is where the Owens' lived for seven years whilst researching their book "Cry of the Kalahari". There wasn't a great deal to be seen but this is the low season. This area is apparently one of the most beautiful areas in the CKGR and it was easy to imagine how beautiful it would be following the rains. The afternoon temperature was over 40°C and we weren't able to do an awful lot other than sit under the awnings. It was even too hot to read. 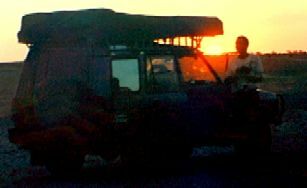 At around four o'clock we took Punda out on a drive to find the cheetahs that Gordon had spied earlier that day. We were unsuccessful but then continued towards another pan where again there was no life so instead we sat on the top of the car and watched the sun set whilst drinking G&T's. I have dreamed about doing this for so long and today was the first opportunity and it was fantastic. On the journey back to the camp we saw what we thought was a bat eared fox but was probably a cape fox. It was dark but we went off road to chase it for a while. Talk about unlucky. We had seen no-one for days and in the five minutes when we were breaking four rules at once (driving at night, off-road, headlighting the animals, camping at the wrong site) we got caught by the marshals. A big apology and fib that the permit was in the other car got us off. Once we arrived at the camp spot one of the tyres was hissing and going down pretty quickly. Our first puncture due to a thorn. The route towards Sunday Pan was much more interesting because of the slightly more challenging terrain and the need to drive very carefully to avoid the buffalo-thorn bushes. The slightly shady campsite didn't offer much respite in the heat of the day. It was over 40°C again and we were fit for nothing. After an hours joint effort doing the Telegraph crossword followed by another evening game drive complete with spectacular sunset we were back at the camp baking apples in the fire. In the morning the wind was blowing but there was no respite from the heat. Even at 8am it was 33°C. We made our way to Rakops along the main route which turned out to be far more challenging than the tracks in the reserve. Fine deep, dusty sand made for an interesting ride. In town we had hoped to find a bank, fuel and somewhere to fix the puncture but when we saw the mud huts we realised we were expecting too much. I did manage to swap some money though with a local and half fill the fuel tank. The diesel pump was hand operated and as the girl was so slow (African time) I gave it a go. A full tank would have been too much work though so I was satisfied with a half fill. As we were in for a bit of adventure we decided to take the 150 km track to Gweta over Ntwetwe Pan. The GPS co-ordinates in Gordons book weren't accurate so we guessed the route north from the many possibilities. A variety of tracks took us through dense prickly woodland (oh no the tyres), through veterinary control points, past two small villages and on to the spectacular Ntwetwe Pan. The vast white flat barren expanse was really exciting to drive across. There was actually nothing to see but driving at speed over it was such fun. The end of the day was marked by the most amazing sunset of the trip before continuing along a harrowing track for another 30 km. We had not anticipated how difficult this part of the track could be. It was dark and the sand so fine that it was like driving blind through dust. Thank goodness for the GPS to tell us which way to go. There was also the gross problem of buffalo-thorn bushes jumping out in front of you to bite your tyres. The cars took quite a beating. The thorny bushes and trees added to the scratches and the dust collection inside the cars was immense. Fortunately neither cars had a puncture and we arrived at the Gweta Rest Camp in the most filthy state. A shower and dinner in this little oasis was heavenly. The next day was Saturday. As it was Saturday everywhere was closed. The puncture repair man would be back at work on Monday and the diesel would arrive on Monday too. So much for only half filling the tank at Rakops! Our plans were rather hindered. There wasn't enough fuel to visit Kubu Island and Nxai Pan and if we waited for fuel there wouldn't be enough time left to visit both places. Andrew and I had to be back in South Africa for a course on the 11th. As Gordon still wasn't feeling well we decided to stay another night at the camp so out came the high lift jack, tyre levers and muscles! Three hours and three litres of water later a huge thorn was extracted from the tyre and the puncture was repaired. That evening a storm soon put an end to the jobs and we had to retire to the bar to play rude scrabble, have some drinks and some tuck. Back on the road in the morning it was a short drive to the entrance of Nxai Pan. The following 37 km to reach the gate through soft sand provided an opportunity to get stuck - hurray. I thought Botswana was meant to be difficult and rough country! Low box again sufficed and we managed to get away without deflating the tyres. We passed a Land Cruiser that had got stuck in the sand and had been abandoned! Once inside the park we immediately went on a tour. 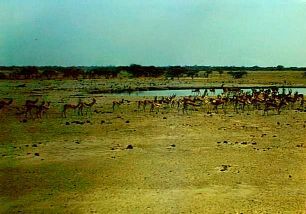 The single water hole (dry season) provided spectacular game viewing opportunities. We were immediately welcomed by four lions (3 female, 1 male) literally metres away from the car. Fortunately post-prandial predators are not interested in humans. The park is really small so it doesn't take long to drive around and get a feel for the place. We spied a flock of vultures around a lump of giraffe and decided to investigate. 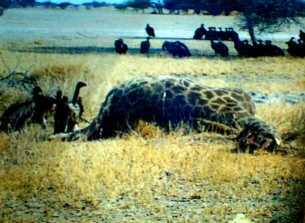 A bit of off-roading (naughty) revealed a giraffe which had probably died the day before whilst giving birth. The baby was only half out and the vultures were having a good feast on mother and baby. Back at the waterhole the lions provided some further entertainment but we had to dash back to the campsite before it got dark. After dinner we joined Tim, Richard & Jenny for drinks. 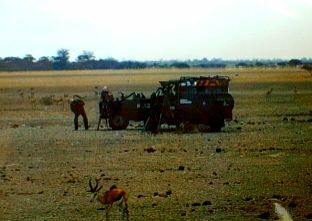 They were filming in the pan and reported seeing five lion kills in one day. We were up early in the morning to get back to the waterhole where we sat on top of the Landys with camera and video equipment at the ready. Gordon was sick again - his symptoms suggested Giardia - but he wasn't letting the illness interrupt the game viewing. After two hours of watching the lions hunting and after capturing about 23 minutes of video footage we both failed to get the kill on film. It was so fast - there was no build up, just a lucky strike. I saw the kill amongst the pile of dust but didn't have time to pick up the video. 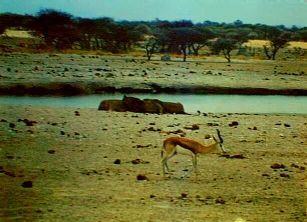 Within minutes there was no trace of the previous springbok. The lions pulled the springbok apart and each took a section. Jackals picked up any bones lying around and the vultures feasted on any bit they could find. 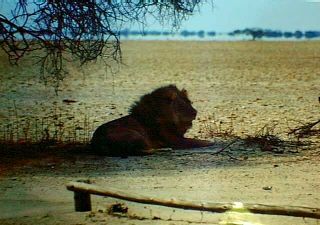 This explained why I didn't see any carcasses in Etosha - there weren't any. On Tuesday 9th it was time to pack up and say a sad farewell to Gordon. He was continuing on to Okavango and then heading north with the intention of reaching Scotland some time next year. 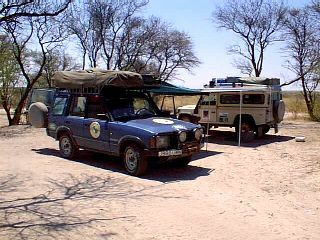 Andrew and I had a course to attend in SA so it was a ten hour drive to the campspot at Gaborone. The diesel still hadn't arrived at Gweta and I wasn't surprised. I had that feeling it was going to be an African "yes". Fortunately Punda had enough diesel to reach Nata. At the campsite in Gaborone they charged a hefty £6 for a wonky piece of land, lots of insects and no facilities. The morning's chores included a wheel change because one of the tyres was flat. At Lobatse the puncture was repaired and the wheel balanced before driving to the border. Botswana has an awful lot to offer but because of the course there was only enough time to see a third of the sights. The country is very big and you need a lot of time to travel because only the main road is tarred. This was the first country of the trip where I had to leave before feeling content that I'd seen as much as I had wanted to, but SA was calling. European style in the restaurants. Mealie meal is a favourite amongst the locals - a bit like thick savoury semolina. Bush camping meant that we mostly ate what we cooked. Be prepared for the park officials who enjoy trying to make life difficult for visitors who have not booked. They are an extremely law abiding lot so you cannot afford to annoy them. Try to get 3rd party car insurance before you get to Botswana as there are only two borders (inc. Kazungula) where you can purchase it on the route in. Botswana has a road tax of 5 pula (80p) per car. Fuel is cheaper than the surrounding countries. Botswana has no restrictions on bush camping unless you are in a park where you have to pay a hefty wad for a flat piece of dust.